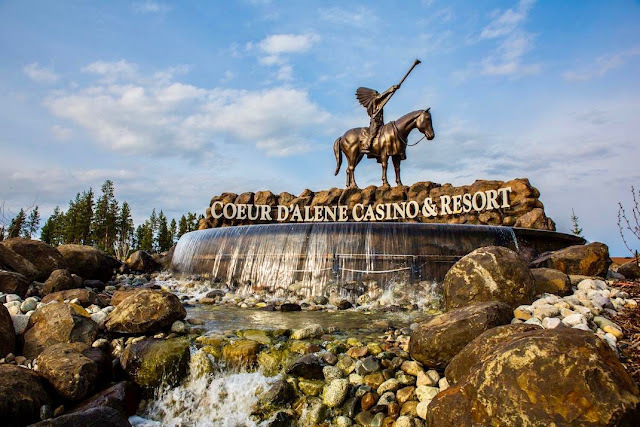 *I spent most of the day today at the Coeur d’Alene Casino in Worley, Idaho. And I didn’t gamble once!! I ate lunch at the Red Tail Bar and Grill, and had a lovely Cobb Salad. I joined some of my P.E.O. sisters from Coeur d’Alene, St. Maries and Wallace. Our mission today was to look at the Casino as a venue for our 2021 convention. You have to plan early and book venues in plenty of time when you plan a convention. We were very pleased with the venue, and it was fun seeing all the different kinds of rooms there are at the Casino, and Josh, the events manager, did a good job of showing us all the things we needed to know. *After our lunching, touring and discussing was done, I had a nice visit with Phyllis Howard, one of our P.E.O. State officers, while we waited for Paul to pick me up. After he dropped me off around noon at the Casion, he drove to Moscow to spend some time with Cosette. *Paul picked me up about 5:15 or so from the Casino. We drove to Coeur d’Alene and stopped at Albertsons and picked up a few items. Then we headed home and arrived just in the nick of time to get Toby his insulin and feed him. We cooked some Tilapia that needed cooked, and had leftover salmon patties and cheese soup and some cucumbers for dinner. I enjoyed another episode of The Midsomer Murders before going to bed and reading from the book A Visit from the Goon Squad by Jennifer Egan.